A seemingly innocuous mid-May series against the Seattle Mariners shouldn’t be as exciting as this one was coming into things. The Mariners, who currently dwell in the basement of the American League East, came to town with a 15-18 record, and an anemic offense that ranked among the worst in the whole league. 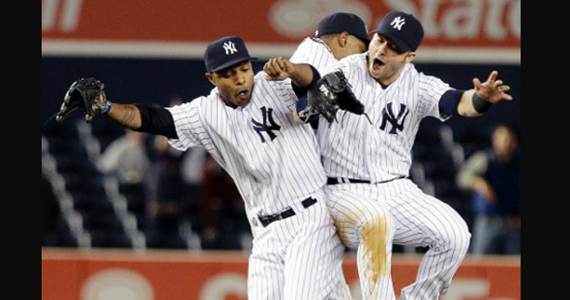 The Yankees were coming off of a series win against the Tampa Bay Rays, and feeling pretty good about themselves. So why was this series so important? Because of Andy Pettitte. The 39-year-old was set to make his 2012 debut (his first MLB game since 2010) in game three of the series. On another note, we got to see Jesús Montero for the first time since the Pineda trade. Here’s how it all went down. This was the game the Yankees were probably sure to lose if you looked at the schedule coming into the series. The Yankees had the inconsistent Hiroki Kuroda on the bump, while the Mariners countered with one of the best pitchers in all of baseball, “King” Félix Hernández. Félix came into this game having only allowed one earned runs in his only three starts at the new Yankees Stadium (24 Ip). No one would have blinked an eye if His Royal Highness had gone out there and beaten the Yankees with another gem. Things didn’t exactly turn out that way. So far this season, Hiroki Kuroda has been very inconsistent. Coming into the game, he’d had three quality starts and three not so quality starts. In this start, he channeled Good Hiroki, and gave the Yankees seven strong innings, netting his third win of the season to go with his four losses. Things did start out a little shaky, however, when Dustin Ackley led things off with an opposite field home run to left. I know I was thinking “here we go again,” but Kuroda really settled down after that. He put a couple of runners on in the second, and loaded the bases in the fifth, but the only other run he gave up was on a solo home run to our former son, Jesús Montero (…sigh). Kuroda’s final line: 7 Ip, 6 H, 2 R, 3 BB, 2K. It’s not the greatest line you’ll ever see, but the key was that he only allowed two runs, and the Yankees won the game after Rapada, Wade, Logan and Robertson shut the door. Yes, I made a nerdy Lord of the Rings reference, but you have to admit it’s clever… ah? Anywho, As I mentioned earlier, the Yankees were set to face King Félix, who came into the game with a 1.89 ERA. He would leave this game with a 2.29 ERA, after allowing four runs on eleven hits in 6.2 innings. After heading into the bottom of the first down 1-0, the Yankees wasted little time in tying this one up. After singling with one out, Curtis Granderson eventually stole second and scored on a two-out single by Robinson Canó, who has really turned it on of late with the bat, and the game was knotted at one. The Yankees would not score again until the bottom of the sixth, after the Mariners had retaken the lead in the top of the inning. Álex Rodríguez got things started with a five-pitch walk and Canó followed that with a single to put men on first and second with nobody out. Mark Teixeira followed with a fielder’s choice which put A-Rod on third and himself on first, and Nick Swisher struck out for the second out of the inning. Just when it looked like the Yankees would strand those runners, Raúl Ibañez came to the plate. Raúl got a first-pitch sinker that didn’t sink and hit a line drive three-run home run over the right-centerfield fence. Suddenly, King Félix didn’t look quite so regal and the Yankees led 4-2. The Yankees would add two more runs off of reliever Steve Delabar in the bottom of the eighth on a pinch-hit two-run home run by Andruw Jones to make it 6-2, which is how it would all end. Once again, Jobu was in the house for this one. The Jobu family celebrated Mother’s Day a day early as my parents, my sister and I took in the game on a beautiful afternoon at the stadium. The game was almost as good as the weather, so we lucked out. Phil Hughes was on the mound looking to continue improving his pitching for the third straight start. He squared off against former Yankees prospect Hector Noesi, who went to Seattle in the Pineda trade. The Yankees went ahead early and never looked back, and my family got to see a nice win at the Stadium. As I mentioned a little earlier, Hughes has been improving by leaps and bounds over his last few starts. He started getting it together in a ho-hum start against the Baltimore Orioles a couple of weeks back, but Hughes has quieted bats and lowered his ERA in each of his last three outings including the gem he pitched in game two against the Mariners. There isn’t much to say about this start, because Hughes was never really in trouble all game long. He scattered six hits and one walk throughout his 7.2 innings (his longest outing since August 19th of last year… happy birthday Jobu), and the only run he allowed was on a solo home run by Mike Carp in the top of the seventh inning, when the game was pretty much already out of reach. I can’t say enough about how good Hughes is. I know it was against the Mariners, but that’s what good pitchers are supposed to do to terrible offenses when they are pitching well. Any team can hit you hard when you’re terrible. Hughes was flat out impressive in this one. Boone Logan pitched the last 1.1 innings for the save, and that was that. Final line for Hughes: 7.2 Ip, 6 H, 1 R, 1 BB, 4K, 112 pitches. Woot. The Yankees pretty much beat Noesi with one inning in this game, and it was the bottom of the second. Canó grounded out, and Teixeira doubled over the shift into the right field corner before Swisher flew out for the second out of the inning. That started the two-out magic for the Yankees. Ibañez doubled to the left field corner to score Tex, and Russell Martin followed with a double of his own to score Ibañez. Jayson Nix, getting a rare start at short, came up next and hit a shot down the right-field line that just cleared the fence for a two-run home run. 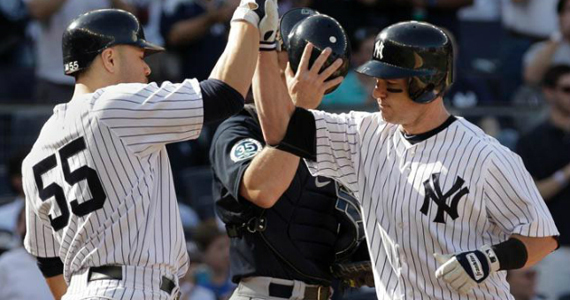 It was Nix’s first hit of the season and his first as a New York Yankee. It also gave the Yankees a 4-0 lead they would not relinquish. Welcome, Jayson. We thank you for your contribution. The Yankees scored two other runs in this one. One, naturally, was on a solo home run by Ibañez. This one was a legitimate home run that traveled about 420 feet to dead center field and pushed the lead to 5-0 in the bottom of the fourth. Ibañez now has 21 RBI on his 24 hits this season. He has more than quieted his Spring Training critics. The last run came in on an RBI single by Canó in the bottom of the eighth. The hit extended Canó’s hitting streak to ten games and raised his average to a suddenly solid .306. It’s nice to have you back, Robby. That was all for the Yankees offense, and it was more than they needed the way the Hughes pitched. This was the big game of the series. It was the one I wish I had gone to instead of the Saturday game I attended, although I picked a great game to go to anyway. This was set to be the triumphant return of Andy Pettitte. Although the old timer left without a lead and a bit of a high ERA, I thought he pitched pretty well considering the circumstances. Andy Pettitte has a pretty amazing ability to make things seem like he never left. For some reason, I feel like he’s been on the team since 1995. I forget that he’s been gone from us twice. I think i have blocked out the three seasons he spent in Houston and the year and a half he just spent away from baseball all together. It was great to see Andy back on the Yankees Stadium mound. Did he pitch three perfect games? No. But he really did pitch well enough to win, and short of a couple of, in his words, careless pitches, and a terrible offensive output by the Yankees against Kevin Millwood, he would have. Andy started out by pitching a no-hitter into the fourth inning. He had three walks, so his command was a little off, but the Mariners weren’t squaring up too many baseballs in the early going. The Mariners’ first hit came in the top of the fourth inning, and also tallied their first two runs. Pettitte left a flat cutter over the plate and Justin Smoak hammered it over the right-centerfield fence for a two-run homer (Pettitte had walked Montero right before that). In the top of the sixth, the Mariners struck again, but it was such a cheapy that I can hardly blame Pettitte. Ackley led off the inning with a single and moved to second on a wild pitch. Casper Wells came up and, while clearly just trying to hit a fly ball to right to move Ackley to third, slapped at a pitch that caught a little too much of the plate and hit it off the right field foul pole. I don’t think anyone was more shocked than Pettitte when that ball went out of the ballpark for a two-run home run. Anyway, those were the last runs that Pettitte would give up. He wasn’t quite “vintage” Andy Pettitte, but he definitely showed a lot for a guy who was pitching his first major league game in a year and a half. Good job, Andy. His final line: 6.1 Ip, 7 H, 4 R, 3 BB and 2 K.
The Yankees were facing Kevin Millwood on Sunday, so a sweep seemed imminent. They got the veteran on the ropes a couple of times but, naturally, were unable to land that big hit. In fact, the only runs on the day were on walks. After loading the bases with no one out in the bottom of the fifth on singles by Tex and Swisher and a walk to Ibañez, they managed to only score one run. Eric Chavez struck out looking on what was a pretty nasty pitch by Millwood, then Martin walked to score Tex. Jeter came up next, but bounced into a rally killing double play and the inning was over just like that. Canó walked with the bases loaded in the bottom of the eighth to plate the other Yankees run, but again, no one could get that big hit. It was a pretty terrible offensive performance for the Yankees, but I feel like that’s been happening a lot this year, so I’m not really shocked. Kudos to the Captain for passing Tony Gwynn on the all-time hits list though, because that’s awesome. 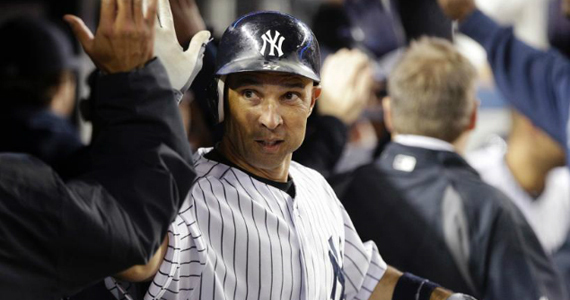 Jeter is now at 3,142 hits for his career, tied with Robin Yount for 17th all-time. Notable Offense: RBI – Martin (9), Canó (14), 2 hits for Swisher and Chavez. We saw a lot of good from the Yankees in this series. They beat up a little bit on one of the best pitchers in all of baseball in game one, pounded a mediocre pitcher in the second game and got pretty great starting pitching in those first two games as well. Kuroda made a couple of bad ptches, but did a great job of limiting damage, while Hughes pitched like the first round pick he once was. I know these games were against the Mariners, and they’re offense is not good, but you’re supposed to dominate bad teams, and the Yankees did that in games one and two. Game three was a little ugly, but Pettitte showed us that he might really be able to help the team this season. 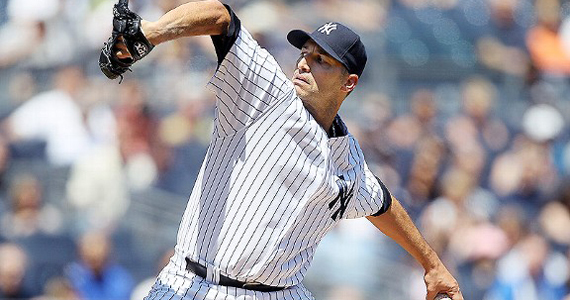 I liked a lot of what I saw from Pettitte and, other than the bad pitches to Smoak and Wells, he pitched quite well. He had good velocity on his fastball, and seemed to have all of his pitches working pretty well. Only the cutter got away from him a couple of times. Hopefully with a few more starts, Andy can shake off the rest of his rust and start winning some games. At the end of the day, the Yankees took two out of three from the Mariners, which is pretty good. One of these days they’re going to have to man up and sweep one of these crappy teams they play, but I won’t complain too much about a series win.